EDITOR’S NOTE: Here is yet another example of a federal program that is working on practical solutions to our future energy needs that is gravely endangered by the warped priorities of Donald Trump and the Republican-controlled Congress. Relying on such advanced materials as perovskites and single-walled carbon nanotubes, the new technology responds to heat by transforming from transparent to tinted. As the window darkens, it generates electricity. The color change is driven by molecules (methylamine) that are reversibly absorbed into the device. When solar energy heats up the device, the molecules are driven out, and the device is darkened. When the sun is not shining, the device is cooled back down, and the molecules re-absorb into the window device, which then appears transparent. A video showing the device switch can be seen here Video. 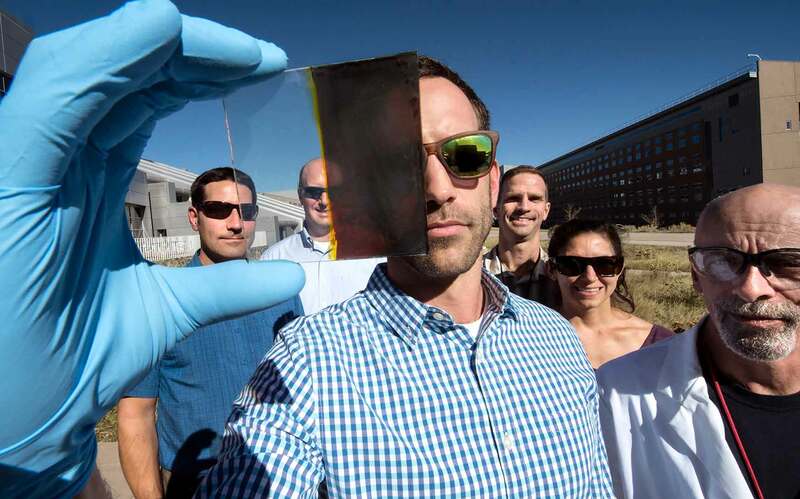 The NREL-developed demonstration device allows an average of 68 percent of light in the visible portion of the solar spectrum to pass through when it’s in a transparent, or bleached, state. When the window changes color—a process that took about 3 minutes of illumination during testing—only 3 percent is allowed through the window. The path to commercialization of the technology was explored last year during a two-month program called Energy I-Corps. Teams of researchers are paired with industry mentors to learn what customers want of the technology and develop viable ways to reach the marketplace. Lance Wheeler and Robert Tenent, the program lead for window technology at NREL and co-author on the paper, teamed up to develop a market strategy for a product they called SwitchGlaze. The effort was funded by the Emerging Technologies program within the Department of Energy's Building Technologies Office.